TORONTO, ON, October 25, 2016 – It’s a scary time of year for many Canadians. Ghouls and goblins will be roaming the streets looking for their next big candy fix on Halloween night. 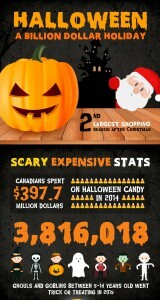 But the real scare is that Halloween has ballooned into money-making holiday. 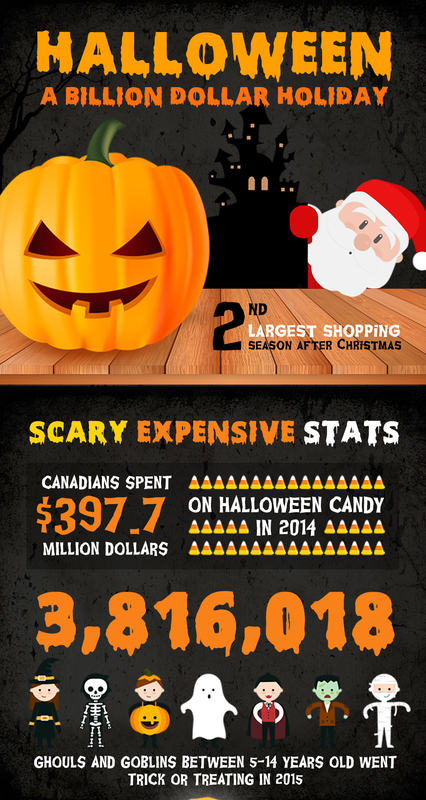 In 2014, Canadians as a whole spent $397.7 million dollars on Halloween candy alone. If you think about it, that’s a lot of money to feed all of the trick or treaters in one night! To give a better idea of how many children head out for candy; in 2015 Statistics Canada says there were approximately 3,816,018 children between the ages of five to 14 knocking on doors for Halloween candy. “Halloween can be an expensive time of year for many Canadians especially if you are trying to play catch up with your summer time credit card bills. Not only that, if you are still trying to figure out your budget for the holidays, you may be ill-prepared for Halloween,” says Jeffrey Schwartz, executive director, Consolidated Credit Counseling Services of Canada. “Nevertheless Halloween is the kind of holiday where many Canadians will stray from their budget to wear the best costume, buy the best candy and have the spookiest home decorations. Although it is a fun holiday it can put you in debt if you are not careful,” says Schwartz. Bring your accessories back from the dead. Little accessories can add up quite fast. Save your money and reuse your accessories from an old costume or better yet, revive an old costume. What is old is new again. Check out your local consignment shop to find like new costumes and/or accessories. You will have fun rummaging through the Halloween clothing racks. Spend your dollars. Your local dollar store is filled with Halloween makeup, costumes and/or accessories. You can score really big and save a lot of money too. The key to having a successful Halloween dollar store shopping trip is to go early. Walk down memory lane. Sift through last year’s Halloween decorations and reuse them, or better yet, do a costume swap with your neighbors.